We just added the French Canal luxury hotel barge, ANJODI to our web site. 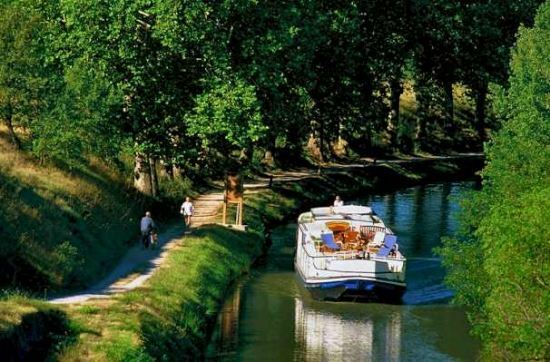 They cruise the historic canal du midi in the South of France. SCOTTISH HIGHLANDER: Barge vacations in Scotland. Theme cruises. We have recently added pages to our SCOTTISH HIGHLANDER site to include their theme cruises. SCOTTISH HIGHLANDER cruises the Caledonian canal between Fort William and Inverness, through the Great Glen and along legendary Loch Ness, encountering some of Scotland's finest scenery along the way. KALIKOBASS II is offering a 10% discount for BVI charters from now through April 23, 2006. 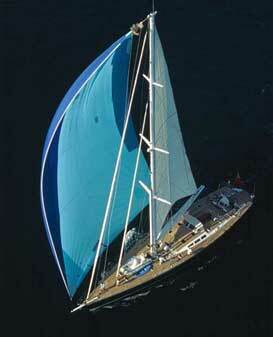 KALIKOBASS is 104 feet long and has the most versatile accommodations in a sailing yacht her size. Each of KALIKOBASS' four staterooms convert from two twin beds to one king size bed as desired. The two forward cabins have a partition that can be removed to make a large "master stateroom" with a centerline king bed. In this configurationKALIKOBASS II is suitable for charters of 6 guests or fewer. The top notch crew of four includes Captain James Benson and renowned Chef Joost Dierickx (three-time winner in the Antigua Charter Yacht Show chef’s competition). 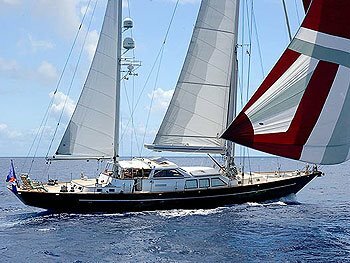 RATE: $45,000/week, plus all expenses for 6 guests or less, and $47,500 for groups of 7 or 8 this winter season (and winter 2006/7) in the Caribbean. KALIKOBASS is available for charter in the Mediterranean this summer (2006). Contact Paradise Connections Yacht Charters for more infomation. SPAM EMAILS... Don't you just love them? This morning we received a spam email selling pharmaceuticals or something but it had a different subject line that caught our attention: "Paradise Connections Manager Has Been Fired". 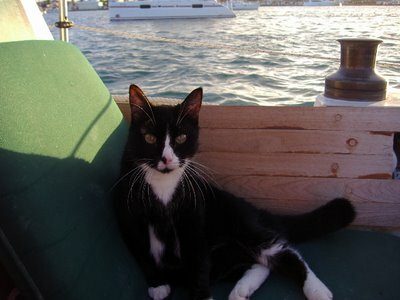 Meet Bullwinkle, ship's cat, also known as Mr.B. He is a valued member of the Paradise Connections Yacht Charters team. Bullwinkle was born in Meaux, France where we built our second sailboat, Loose Moose 2. He has many sea miles under his collar! SAILS CALL has new crew and are offering a 10% discount for charters booked before May 1, 2006 for charters to be completed before December 15, 2006. 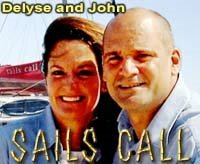 John Barbaro & Delyse Webb would like you to take advantage of this special offer and join them aboard SAILS CALL, a 45-foot Leopard catamaran. This catamaran is fully air conditioned and accommodates up to six guests in three cabins with ensuite heads. 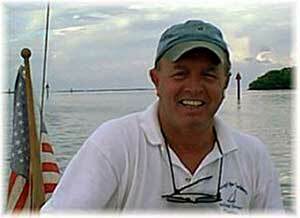 Captain Ken is offering a "cabin cruise" charter aboard his catamaran CARIBBEAN SOUL June 22-28, 2006 (6 nights). As of today, one cabin has been booked which leaves two cabins available. CARIBBEAN SOUL will depart and end from the Frenchtown Marina in downtown St. Thomas, US Virgin Islands. CARIBBEAN SOUL is offering a terrific rate of $1,695 a person based on double occupancy ($2,195 for 1 person in a cabin). Interested in sharing a yacht but not a good week for you? Let us know and we will inquire for your dates. Never hurts to ask! The motoryacht STARSHIP will be in Nassau, Bahamas April 1-10, 2006 and they are offering a special rate of EIGHT nights for the price of SEVEN. Join Captain Jesse Badger with his crew of 8 and explore the clear blue sea of the Bahamas on this stylish and popular yacht! 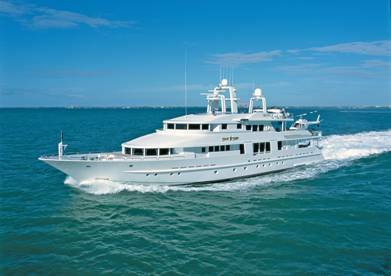 STARSHIP is a 143’ Van Mill Tri-deck motor yacht and accommodates up to 12 guests in 5 staterooms. STARSHIP is available for charters this winter in the Caribbean for $115,000/week, plus expenses. They will be in the Mediterranean this summer where their rate will be $145,000/week plus expenses (low season) and $150,000/week (high season). For more information on this exceptional yacht, contact Paradise Connections Yacht Charters. Cruise along the canals in the South of France aboard CLAIRE DE LUNE. CLAIRE DE LUNE is a purpose-built passenger barge, designed and built by Berend Gozens. She is 100 feet long, and accommodates up to six guests in three cabins, each with their own toilet facilities and showers. The three equivalent spacious guest cabins can be set up with a double bed or two twins as preferred, and they each have individual controls for air conditioning and heating. Don't forget the Jacuzzi on the bow! CLAIRE DE LUNE is also available for private, full barge charters. Rates vary according to season, and the number of people in your group.